We’re not there yet but the end of the season is fast approaching and this weekend we’re inviting you to purchase tickets to our presentation evening on Saturday 23rd April and vote for your 2015/16 Supporters’ Player of the Year. 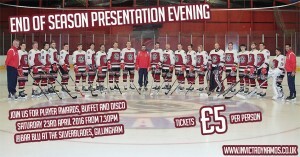 Our end of season presentation evening will take place at Bar Blu inside the SilverBlades Gillingham on the evening of Saturday 23rd April and will include our player awards, a buffet and a disco. 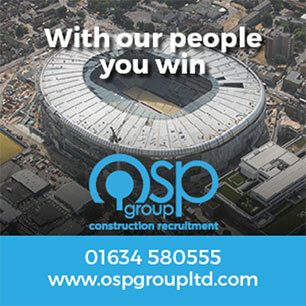 It’s the perfect conclusion to the campaign and your chance to mingle with the players and fellow supporters before the lengthy summer break. Fans of all ages are welcome to attend and tickets for the night can be purchased at £5 per person from Jackie Mason this weekend. As well as joining us for the night we also want you to cast your vote for your 2015/16 Supporters’ Player of the Year – an award presented in memory of long-time fan Christopher Rushton. Forward Callum Fowler scooped the honour last time around and the recipient for this term is once again in your hands as we give you the opportunity to have your say this weekend. Look out for voting slips at our home game against the Milton Keynes Thunder on Sunday and be sure to make your voice heard. What: Join us for player awards, a buffet and a disco. When: Saturday 23rd April 2016 from 7.30pm. Where: Bar Blu at the SilverBlades Gillingham. Price: £5 per person. All ages welcome. Purchase your tickets this weekend. In the meantime the season isn’t over yet as the Dynamos being their playoff challenge against the Milton Keynes Thunder. Join us for the 2nd leg in Gillingham on Sunday 3rd April. Doors open at 4.30pm with faceoff at 5.15pm. Tickets for the clash are available from the rink now or at the door on the way into the venue on game day. Watch our playoff promo below and then join us for a massive weekend.